What do you know about this time in British history? 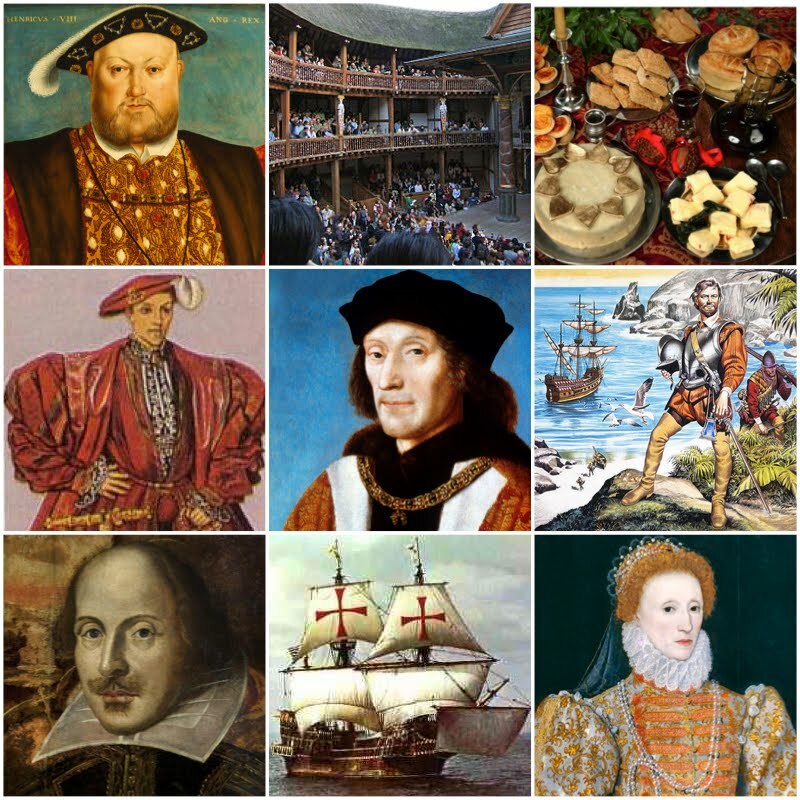 What would you like to know about the Tudors? What happened to the wives of Henry VIII? Not all of them were killed. Can anyone find out? List all the Tudor monarchs in chronological order Al-Baraa. Catherine of valois 1401-1437, Margaret Tudor 1489-1541, James IV of Scotland 1473-1513, Anne Boleyn -1536, Lady Jane Gray 1537-1554, Mary I of England 1516-1558, Edward VI of England 1457-1509, Henry VII of England 1457-1509, Elizabeth I of England 1533-1603, and Henry VIII of England 1491-1547. I'll do the chronological order in my house. The royal British family ruled over Britain for 118 years, King Henry VII was the grandfather , King Henry VIII was the father and at the time his wife Cathrine of Aragon was mother then came the children which were Edward VI then Elizabeth I then Mary I. Next inline to the throne was Edward VI but he died age 15. Cathrine Parr and Jane Seymour were cousins. Lady Jane Grey was Queen in 1553 Nother Cumberland made her Queen because she was Protestant and gran daughter to Henry VII. She was also NotherCumberlands daughter in law, she sat on the throne for nine days until Mary I raised a army and killed Cumberland and Lady Jane Grey was pushed of the throne and her head was chopped of and placed on a spike. The symbol for the royal family was a rose up until today then it changed to a lion and a unicorn. Super research Ellie, Jessie and Jayanna. Now we know all about the Tudor monarchs, can anyone tell me about another famous Tudor. Maybe an explorer or politician. Shakespeare and Henry VIII. Are they the same? For example Henry VIII chops the ladies heads of. Is William Shakespeare the same as him?, Chopping the ladies heads of with a sharp blade. Can anyone answer Konrad's question. Were Shakespeare and Henry VIII the same person? Shakespeare isn't the same person as Henry VIII because Henry VIII chops the wife's or the ladies heads off, and Shakespeare doesn't chop his wife head of. The Tudors ruled England from 1485 to 1603. The first Tudor King was Henrey VII. He became King after the battle of bosworth field witch ended the war of roses. He was followed by his son Henrey VIII. Who was famous for marrying six times and beheading to of his wifes. Not all of his wives were beheaded Abdu. Can anybody tell me the names of each of his wives and what happened to them? The Tudors were a Welsh and English family that ruled England and Wales from 1485 to 1603 one of the most exciting periods of British history.The Tudor period is the period between 1485 and 1603. The first Tudor King was King Henry VII who claimed the throne when his forces defeated Richard III at the Battle of Bosworth Field in 1485. The Tudors weren't expected to take the crown . The Tudors ruled for 118 years.Monarchs in the Tudor times rarely married for love often they married to link up families to other rich people in England. Why did Henry the eighth have 6 wife's and then chopped most of there heads of. Did you know that they eat apples instead of popcorn because popcorn was not invented. Did you know that if you take a picture in the Tudors life you would not take a picture you would have to paint it instead. The tudors have a the tudors have a rose named after them which is called (the Tudor rose).William Shakespeare was born in 1564 and died in 1616.william Shakespeare died on his birthday.William Shakespeare's parents were called Mary and John.William Shakespeare grew up up in Stratford (Avon).William Shakespeare died at the age of 52.Henry the 8th killed all his six wives.William Shakespeare married a woman 8 years older than him. What about life as an ordinary person in Tudor times? Find out about what clothes they wore, food they ate and jobs they did. Life was not that good some had an house and sum were poor an some were broke in Tudor times. Girls clothes were disghned a triangular shape. While men's clothes was an almost square shape. People earned money by spinning, weaving and other jobs such as wood turning and leatherwork. Shakespeare was the boss of the city in the Tudors he was also the boss of a globe theatre.In the Tudors there was a rat dezez so Shakespeare told everyone to stay in there homes because if the rats bite you you will get sick and die.Shakespeare use to be a comedian show but he had no choice so he had to start riting poems.Henry 8 had six wives and 2 was devorsed 2 was beheded 1 died herself and the last one survived longer than Henry 8.Henry 8 was the king of the Tudors if someone does not behave in the Tudors Henry 8 will put them in a wood and he calls everybody to come see and he will cut there hed.In the Tudors at school when you misbehave the teacher will get a cane and and smack your hand with in the Tudors time they didn't use t give chances and they wasn't very nice. Did you know that Shakespeare died on his burthday. And he was 52 years old. Lady gray wasn't meant to be queen but the King said that when he died lady gray will be queen but lady gray killed someone so when she became queen she was in jail so she only for 9 days. When Edward VI was 9 years old the became king but for only 9 years because he died at age 17 because of and illness. Candle wax was very expesive in Tudor times because people very rarely had the ingredients to make it. The Tudors were kind but that did not mean that you can steal because if you were then you would be hanged up or either get your head chopped of. I like the play Romeo and Juliet because Outside the Capulet crypt, Romeo comes upon Paris, who is scattering flowers on Juliet's grave. They fight, and Romeo kills Paris. He enters the tomb, sees Juliet's inanimate body, drinks the poison, and dies by her side. Just then, Friar Lawrence enters and realizes that Romeo has killed Paris and himself. 8 Sep 2011 - Elizabeth was a daughter of King Henry VIII and his second wife Anne Boleyn. She was born a princess, but lost this status when Henry decided to have Anne's head chopped off, when Elizabeth was just over 2 and a half years old. After this and until she was "Queened" she was Lady Elizabeth. Edward VI was King of England and Ireland from 28 January 1547 until his death. He was crowned on 20 February at the age of nine. The son of Henry VIII and Jane Seymour, Edward was England's first monarch to be raised as a Protestant. If you were a catholic when Henry VIII was king then you would be thrown into the Tower Of London,go into prison or they would kill you. If you were protestant when Mary I was queen then you would be thrown into the Tower Of London,go into prison or they would kill you. When Mary I was queen she killed more than 100 people because of there religion so people started name her Bloody Mary. Did you know that the tudor symbol was a rose. Henry the 8 had six wives but he chopped of all there heads . Henry's wives;Katryn Parr [survived],Cathrine Howard [beheaded],Anne of Cleves [divorced],Jane Seymour [died],Anne Boleyn [beheaded],Kathrine of Aragon [divorced]. did you know that Henry the viii only chopped of his wife head because he never had a son also do you know that the tudors have a rose named after them self and i'ts called the tudors rose.Another thing is that willam shakespeare was born in 1564 and died in 1616.Willam shakespeare died on his birthday Willam shakespere's parents was called mary and john Willam shakespeare grew up in Statford opon Avon.Willam shakespeare died at the age of 52 also henry the viii killed all his six wifes.Willam shakespeare mareied a woman 8 yeas older than him also Willam shakespear's dad was the mayor of stratford and his mum was mother's farmer. William Shakespeare did not attend university.His first play was (The Taming of the shrew) and was made in 1543.William Shakespeare invented the word (hurry).William Shakespeare is known to have invented the 1700 words of the 17677 words he used.William Shakespeare invented the words (assassination) and also (bump).